Windows DreamScene (codename Motion Desktop, later changed to Borealis) is a animated wallpapers and video technology that enable Windows Vista Ultimate users to use and run high-resolution and high-definition video contents as their desktop background as part of the Windows Vista Aero Glass user interface. In short, instead of selecting static photo or picture image as your desktop background, you can now select video or or motion picture as your come-to-live desktop background with DreamScene. In DreamScene, some sample of the high-quality looping videos produced by Stardock Design will be included, which can be used for free as your Vista background. According to WinCustomize, Stardock Design produced all of the non-photographic based DreamScene content, in addition to develop enhancements and tools such as 3D rendered contents including Aurora to extend the capabilities of Windows DreamScene. Beside, Ultimate owners can use a video from a company that produces content for DreamScene, or even use their own video as a background. The main advantage of Windows DreamScene is that the feature will not be using significant amounts of CPU, due to its utilization of the hardware accelerated Desktop Windows Manager (DWM), as shown in demonstration during CES. All processing, animation and video playback are done on video graphics card, and basically the decoding of the video is the only real CPU use involved. Beside, Windows DreamScene is also smart enough to scan your battery power settings and pauses the video to conserve battery power. Windows DreamScene only support .mpeg and .wmv video file formats, and for DreamScene to animate the video, it requires a graphics card with specification that supports Windows Aero. In another word, your Windows Vista Ultimate must support and enable Windows Aero Glass in order to DreamScene to run. However, if your computers do not support the Windows Aero desktop experience, this Extra will add new positioning options for backgrounds, including stationary pictures. 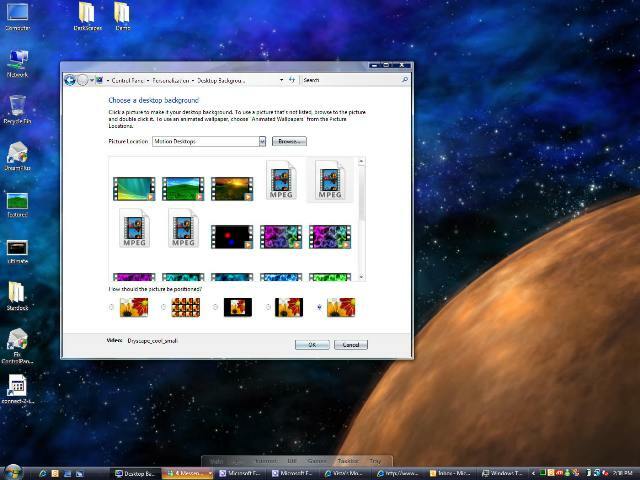 Windows DreamScene is part of the Windows Vista Ultimate Extras package, and thus can be downloaded as part of “Ultimate Extras”, which is available for download from Windows Updates. Of course, your Windows Vista Ultimate must be genuine, activated and passed WGA validation. Windows Vista Ultimate website (link dead) has a video clip showcases the features and what desktop will looks like with Dream Scene. As mentioned above, Windows DreamScene supports user generated contents, videos, animated pictures, tools and enhancements. Once Vista is generally available, it’s believe that you will be able to find a lot of websites and repositories hosting and distributing huge gallery of contents for DreamScene, such as at Dream.WinCustomize.com. It’s also possible to download video clips from video sharing sites such as Youtube, Google Video, Metacafe, iFilm, DailyMotion and etc, convert the video to DreamScene supported format and set the video as wallpaper, albeit the video will be of low quality. You can also view video demo of Windows DreamScene in full motion desktop demo video here. Update 1: Download free standalone Windows DreamScene beta. Update 2: Download official beta release of Windows DreamScene.